The Jerdon HL88CL 8.5-Inch LED Lighted Wall Mount Makeup Mirror stands out with its sleek and modern look, while providing close-up magnification for flawless makeup application. Add a touch of glamour to your home with a makeup mirror that is used in luxury hotels and spas because of its convenience, sleek look and precise magnification. This two-sided circular mirror has an 8.5-inch diameter and features a smooth 360-degree swivel design that provides 1x and 8x magnification options to make sure every detail of your hair and makeup are in place. An on/off rotary switch on the base will activate the LED Halo lighting around the perimeter of the mirror when you need it. LEDs are lined around the mirror to distribute light evenly. LEDs use less energy (5-watts), are good for the environment and remain cool to the touch. The extension arm and smooth rotation adjusts to all angles for a dynamic point of view. The HL88CL extends up to 13.5-inches from the wall and can be easily moved around, while still being firm enough to hold for odd angles. This mirror has an attractive chrome finish that protects against moisture and condensation and is designed to be wall mounted. This item comes complete with mounting hardware and a 6-foot cord with plug. The Jerdon HL88CL 8.5-Inch LED Lighted Wall Mount Makeup Mirror comes with a 1-year limited warranty that protects against any defects due to faulty material or workmanship. 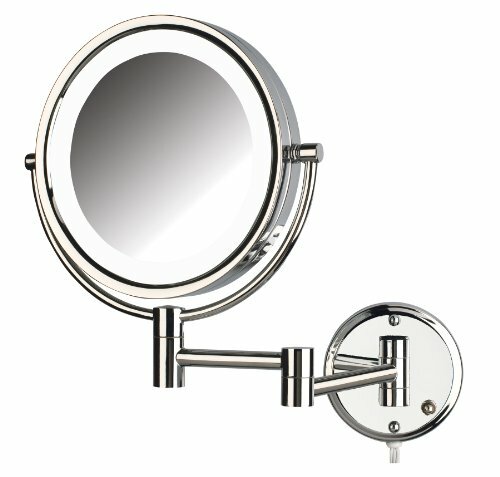 Jerdon has earned a reputation for excellence in the beauty industry with its broad range of quality cosmetic mirrors (including vanity, lighted and wall mount mirrors), hair dryers and other styling appliances. For over 40 years the Jerdon brand has been a leading provider to the finest homes, hotels, resorts, cruise ships and spas worldwide. The company continues to build its position in the market by both improving its existing line with the latest technology, developing new products and expanding its offerings to meet the growing needs of its customers.